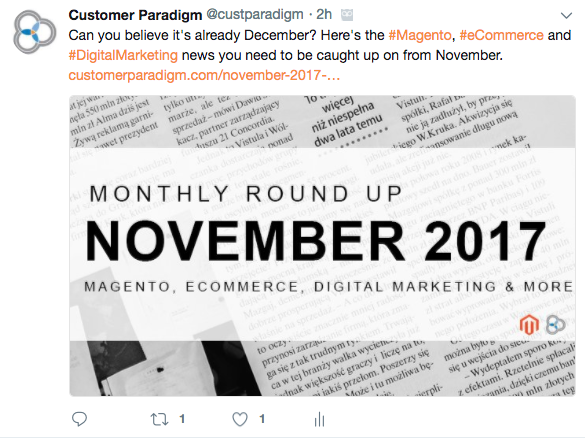 You’ve decided to dive into social media marketing for your eCommerce business… you’ve set goals and decided which platforms you want your brand to be on – but now what? How do you begin writing content for your social media posts? Each social media post is a representation of your brand for the whole world to see, therefore it is important to know a few social media writing basics to avoid looking sloppy or uninformed. The first, and most important step, is to define what your brand’s voice is. Your voice is your online persona – essentially the personality of your brand. People expect a consistent voice on social media – and nobody wants to talk to someone who is boring. You will need to develop a voice that is true to your brand, and engaging for your followers. What kind of language does my audience use, and what sort of language has resonated with them throughout other aspects of our marketing? What does my competitions voice sound like? What is the purpose or mission of my company/brand? What does my company/brand value? 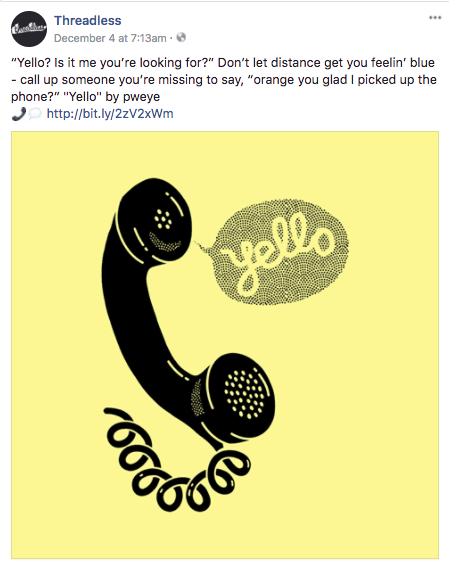 Try writing a few posts in different voices to get a feel for the voice that works best for your brand. Are you a serious, professional brand? Silly? Creative? Playful? Try out a few styles to see what works for you. T-shirt company Threadless takes on a playful voice that reflects the type of products they sell and their target audience. Some platforms have character limits, and some do not. Keeping your post (on any platform) short and sweet is the way to go. People tend to skim when scrolling through their social media feeds and many users view from their mobile phones or tablets. Lengthy posts may simply be skimmed over by many of your viewers. Studies show that tweets that are 100 characters or less get 17% more engagement, and that Facebook posts that are 80 characters or less receive 66% more engagement. 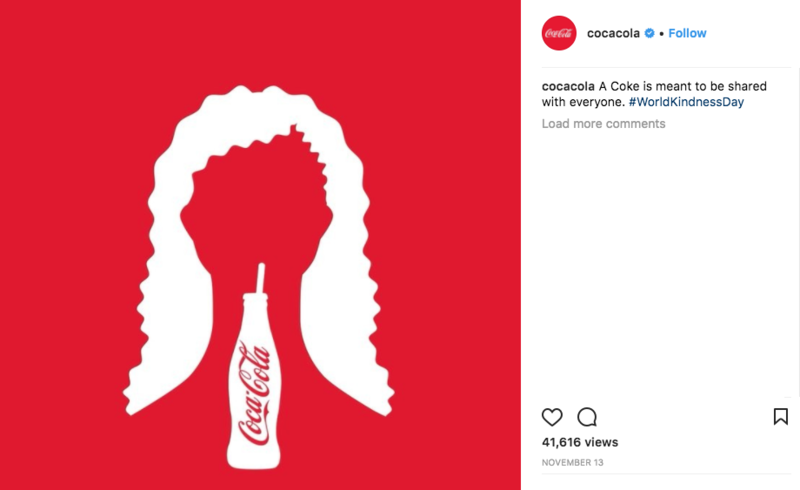 Coca-Cola keeps it short and sweet with their Instagram copy. From reading an article, to attending an event, to make a purchase, most posts have an underlying goal of your viewer completing an action. Using the right words can make a huge difference in your post engagement and end goals. You want to create a call to action that is relevant and engaging without treading into hard-sell territory. Studies show that the words: you, free, because, new, and instantly are the most persuasive words – however, you know your target audience best, so choose the action words that resonate with your customers. Try asking questions, asking opinions, and making use of the words: how, who, what, why – people tend to respond well when they are being asked something. 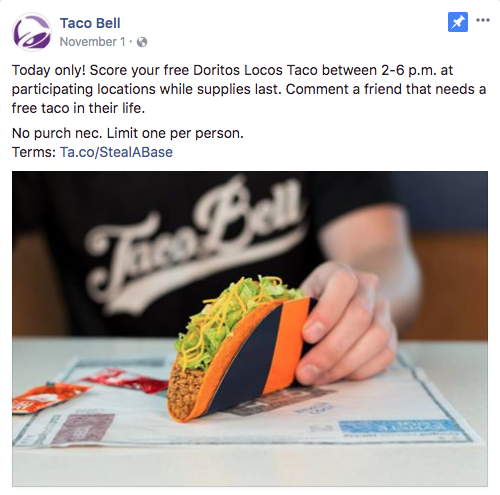 Taco Bell utilizes effective action words with their call to action in this post using the words “comment” in order to get something “free”. 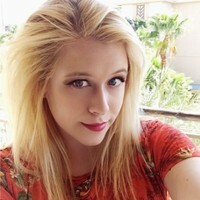 Organic social media content should be written to make a connection with your customers. You should aim to inform and entertain them, rather than simply writing content with the intention to make a sale. The Facebook algorithm is designed to detect language that is overtly promotional and then not show them as frequently in news feeds, leading to a smaller post reach on these posts. Try creating social media posts that intimate for your followers (whether you have 10 followers or 10,000) by using “I”, “We”, and “You” pronouns in your copy to make your posts feel more like an authentic conversation. Like it or not, the use of emojis has become widespread and are becoming a language all on their own. Studies show that 92% of people are now using emojis and many consider the use of emojis to be the fastest growing language worldwide. If you are going to use emojis, do so organically and in a way that helps you convey a thought more simply. Always make sure you know what the emoji you are using means – as many emojis mean many different things to different people. Try incorporating creative use of emojis throughout your posts to add a splash of character and show off the human side of your company. 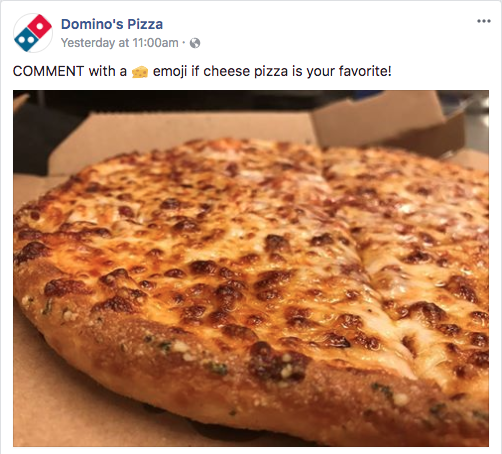 Fast food pizza chain, Dominos, often makes clever use of emojis in their posts. Hashtags are a user-generated content tagging system. Hashtags have always been popular on Twitter, however recently they are seeing an increase in use on other platforms such as Facebook and Instagram. Hashtags can be a great way to gain a bigger audience from your post, as many people will follow feeds of hashtags they are interested in. With social posts, you only have so many characters to convey an emotion. In this setting, it is okay to forget some of the traditional rules about punctuation and capitalization in order to make your point. While you never want to write a post entirely in caps, capitalizing a word or two for emphasis is perfectly acceptable. Try using extra punctuation to make your posts easier to read (studies show that tweets that are retweeted are more likely to have punctuation), or a well-timed exclamation point to denote excitement. 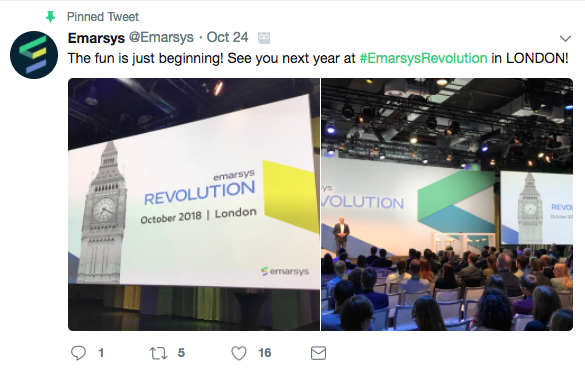 Emarsys uses a well-timed, all caps, word to denote excitement for the location of their next conference. This one is a no-brainer – if you have visuals accompanying your copy they need to work together. Try having your post copy reflect your image copy to create a consistent experience for your followers. 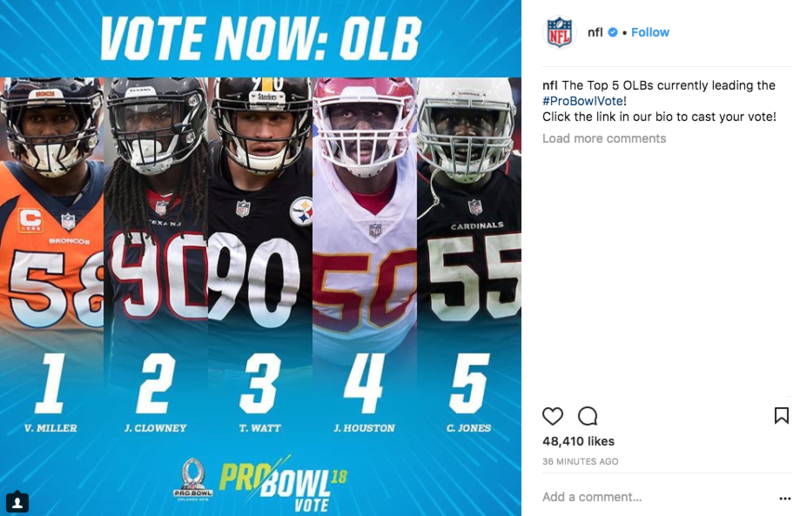 This Instagram post from the NFL is an example of the image copy reflecting the post copy. When writing in a casual, conversational tone in a setting with a character limit it can be easy for people to misinterpret the meaning of your post. Once you post on your social platforms, anyone can see that post and begin sharing it. Make sure your posts convey the right meaning, and are appropriate in the context of what is going on in the world. Try using a tool to help with your editing process – there are tons of free and paid tools available online that will integrate with your browser. I personally like service Grammerly for this purpose. Getting started with social media marketing for your eCommerce business is a big step! These tips will give you the tools you need to write effective posts that help drive traffic and sales to your store. Need help getting started with digital marketing for your business? Connect with a member of our strategy team today and start reaching your eCommerce goals.